The first box of 2016 will feature several fantastic items from Village Tea Company, including a not-to-miss teaware item. Janon, the company's CEO, shares more about the Village Tea Company and their passion for their tea and products. What is Village Tea Company and how did it get started? My name is Janon Costley and I am currently the CEO of Village Tea Company Distribution, Inc, owner and distributor of the Village Tea Company brand of premium loose leaf tea, accessories and other complimentary organic/natural food and beverage products. The Company was founded by my business partner, entrepreneur, tea expert and brand development guru, Martin Ekechuwu. Before launching Village Tea in 2009, Martin worked for Dr. Pepper Snapple Group, and became fascinated by the research available on the health benefits and diversity of flavors of his favorite beverage – tea. Martin had loved tea for as long as he could remember, sharing many a cup with his grandmother as a child in central Europe and finding time to enjoy tea every day as an adult. Although a fan of tea himself, Martin could not understand why it hadn’t really taken off in America like coffee or carbonated drinks; most teas he found domestically often lacked flavor and did not have the fresh packaging or innovative marketing that would ever make it accessible and desirable for the main- stream consumer. Plus the quality of the teas found in traditional tea bags was so poor, they barely resembled the teas of his youth. This “tea dust” failed to provide the health benefits that high-quality loose leaf teas were known for so Martin knew that he could do better. He embarked on a worldwide, tea-tasting journey, hoping to discover the right flavor combinations that could deliver truly unique and delicious products—along with a spoonful of health benefits—to American consumers. After sampling hundreds of teas from around the world, he developed his own blend of innovative teas with a vast array of combinations to choose from and so began Village Tea Company. Village Tea has lots of neat tea options. How does the company come up with the different blends? We only use premium loose leaf tea in all our batches because of the ability to gain more antioxidant and healthy properties versus your traditional tea bag ( or tea “dust”). 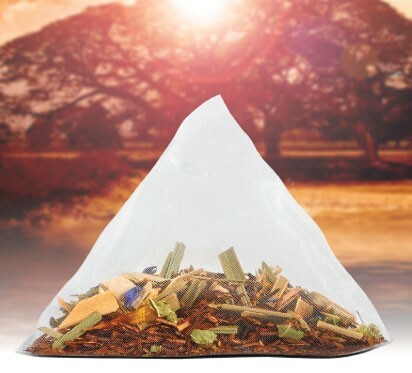 Each tea is blended by hand and packaged by hand into one of our 100% biodegradable ( recycled paper) canisters. We source fair trade ingredients for most of our blends and all of our tea’s are now 100% organic. The base flavors are imported and blended to order based on our proprietary flavor combinations which are primarily created by the company founder, who is a tea expert as well as product development specialist having worked for a number of well known food and beverage consumer products companies in brand development and brand management capacities. Village Tea features its own portable teapot. Can you tell us more about this? Our Mobile Tea Pot has become one of our most popular items. We introduced the mobile tea pot and our travel size (size of a tube of lipstick) loose leaf tea canister, affectionately called, Teasers (currently available in 5 flavors containing 3- 5 servings of tea) as a way of addressing two issues; the need for people to have the ability to take their favorite cups of loose leaf tea with them as they are moving throughout their busy lives but also as a way of simplifying the process for preparing loose leaf, which can be a hindrance for people who are new to drinking loose lead tea. Simply open your Teaser and empty one - 2 servings of tea into the mobile tea pot, add hot water and let it steps for your desired flavor profile. The mobile tea pot is made of double pane, BPA free high quality material, which can be used to steep 1-1/2 cups of tea at a time. You can consume the product directly from the unit ( once it cools) or simply pour it into your favorite tea cup when you get to your destination. Our teas and ingredients are sourced from all over the world where quality teas are grown. Traditionally we have sourced teas directly from farmers in various countries such as: Sri Lanka for black, China for Green, Black,Oolong and White and South Africa for Rooibos. We have recently expanded our sourcing into other areas such as India. Which tea from Village Tea is your favorite? As the CEO of the Company of course I am a little biased because I like them all depending on my mood, time of day, need and benefit. For a good nights sleep I may drink Our Comfy Organic Chamomille, if I am not feeling well I may have a cup of Organic Lemon Ginger, for an afternoon pick up or everyday antioxidant I may sip on our Cherry Rooibos w/Acai (our most popular flavor) and if I am in the mood for Iced Tea , I will probably mix use our Sweet Grace Vanilla Rooibos with our Pura Natural Organic Agave Sweetener for a fantastic refreshing summer beverage. All of our flavors are fantastic and excellent sources for receiving natural health and wellness benefits with each sip. Thanks Janon! To learn more about the company and products, visit villageteaco.com. To purchase a January box, sign up for a subscription or gift by January 5th. Tea Box Express's November box will feature a tea from FashionistaTea. Brenda, the founder, shares more about her company, herself, and how she has blended two loves together to create quality tea with a stylish presentation. What is your background and how did you get involved in tea? Tea has been a love of mine since I was a teenager drinking tea with my Mom at the kitchen table. Then going out with girlfriends to celebrate special occasions having afternoon tea in tea salons and fancy hotels; I just loved everything about it the etiquette, the fine china, the tea pots (which I collect), the scones and the tiny sandwiches. The whole ritual of taking the time to connect, slow down, especially in this busy world, always appealed to me. As I started to travel more, especially trips to Paris, I discovered different types of tea and that there was much more than what we might see on grocery store shelves, led me to read more about tea and study tea more intently becoming a member of The Specialty Tea Institute. You can never learn enough about “tea” so I am excited to be on this journey! We’re also happy to give tea a purpose by working on a Holiday Tea fundraiser to benefit an organization that helps children and young adults here in New York City. How did you come up with the name and where does the “fashion” part come in? We are a private label company and the teas are sourced from that company which is based in Los Angeles. They were selected because of their relationships with small growers around the world and the owner is known as a master blender in the industry. For example our Orange Chamomile comes from a small Egyptian Chamomile farm in Egypt. It was also important that our tea collectionbe Organic and or Fair Trade to help the environment. We love the idea through Fair Trade that we are helping small farmers on the other side of the world to work in better living conditions and help provide for their families. Which tea from FashionistaTea is your favorite? That’s a little hard, they are like children and we love them all. But I am partial to our signature Organic “Fashionista” blend, which I created with my tea blender, it was an homage to many of the teas I have enjoyed in my travels, so I had specific ingredients in mind and we went back and forth a few times, tasting and testing until it was something everyone liked. Some mornings I love it without anything and sometimes in the afternoon, I enjoy it with a little milk. Thanks Brenda! To view their tea selection and learn more, visit fashionistatea.com. To order a November box, sign up for a subscription or gift by November 5th. It's October! This month, we have a delicious tea from a unique company. Marcus Stout, President of Golden Moon Tea Company, has a lot to say about his company, their teas, and his quest for pure toxic-free ingredients. How did Golden Moon Tea get started? Golden Moon Tea was founded based off a transcendent experience in France in 1994. It was while sitting at an outdoor café on the Boulevard St-Michel that we were first shown the elegant and delicious experience of loose tea. Between the selection of the large tea leaves, the pouring of the water, the wonderful aroma and the rich flavor we were hooked. It was at this moment that we knew we needed to bring real tea like this back to the US. Since then Golden Moon Tea has only sold whole leaf tea and strives to create the same experience that we had that sunny day in Paris. Our teas are sourced from farmers who are committed to growing teas the right way. This means that there are no pesticides or chemicals used to “enhance” the tea leaves. The main countries where we get our teas are from the traditional tea growing nations: China, India, Taiwan, Japan and Sri Lanka. For botanicals, we heavily research where they are from and try our best to source from the origin country. For example, the best Bourbon Vanilla comes from Madagascar. Because of this we source our vanilla beans directly from the best vanilla farms in the country. In the beginning of 2013 I was at one of those points in my life. I was in a rut where I just felt off. I had little energy, was grumpy and felt like I was starting to burn out. I needed to make a change so I made a drastic change in my diet. I decided to remove all harmful chemicals from everything I eat and drink. This means I do not eat any GMO’s, pesticides or any other manipulation that was created by the food industry. The change in my life was astounding. After a few weeks my mind was crystal clear whereas it felt like it was foggy before. I had energy. I lost a ton of weight. The interesting part of this is all of this was due to avoiding hidden chemicals in processed foods. When I decided to apply these same changes to my teas I was shocked. I was shocked that I was lied to by omission by our flavor companies. I was shocked to find out how many chemicals are found in teas that were promised to be pure. The biggest surprise came when I found out how GMO’s and plastics are used in the making of teabags and other teaware. I needed to review each and every one of my teas and find pure alternatives. My quest for pure teas hit a dead end right away. I was told over and over again that I cannot make blends without the use of any chemicals or “natural” flavors from almost every vendor I know, even well respected tea blenders that sell to the largest tea companies. It seems that the food and flavor industry is so intertwined with tea it is almost impossible to avoid them. I could see right way that I was on my own. I needed to source each and every ingredient myself to ensure its purity. This was the only way I could ensure that everything I used was actually grown and not made with hidden chemicals. After 8 months of searching, sourcing and testing every tea leaf, vanilla bean, mint leaf and other crops used for our blends, I am proud to say that our teas are now 100% pure. The food industry does not manipulate us like they do every other tea company. This means no pesticides, GMO’s, plastics or “natural” flavors that are created in a lab. Just pure and toxic free tea. Which Golden Moon tea is your favorite? Interesting question. I really don’t believe in favorites (not for tea, food or anything really). What I like to do is think of the best tea for the situation I am in. On a cold snowy day after being outside nothing beats a authentic Chai that is brewed directly in milk. In the early spring I love a cup of vibrant Sencha first thing in the morning when the scents of Spring are at their strongest. And if I am having a full blown breakfast with pancakes or waffles I love Sinharaja with milk - It just brings me back to my childhood. Thanks Marcus! To learn more about Golden Moon Tea and view their tea selection, visit goldenmoontea.com. To order an October box, purchase a subscription or a gift by October 5th.